Eco-friendlier! We create less waste and recycling. But I did run into one little snag the first year I wrapped all of our gifts with cloth gift bags: gift tags. Those little card stock gift tags you tape onto presents? They just kept falling off. Tape doesn't work well on fabric. At least not the scotch tape I was using. Sticker gift tags didn't work either. But I soon thought of a solution: reusable gift tags. I used the same idea as the one I came up with for the numbered tags for my Children's Book Advent Calendar Countdown. I made super simple gift tags using index cards punched several times at the top to make them easy to string along the ribbon used to tie the gift bag shut. I decorated them with holiday stickers from my childhood collection (a little scary that I still have these). I put clear box tape over the stickers to prevent my little ones from peeling them off. These tags work well for me since we generally purchase and wrap a set number of gifts for each child from the same people year after year (one gift from Mami and Papi, one gift from my parents selected and wrapped by me, one gift from Santa). I also have made gift tags to and from "Tia," since my sister often spends Christmas with us. I stash the tags with my cloth gift bags and ribbons for easy reuse. How do you label your gifts wrapped in reusable gift bags or fabric? 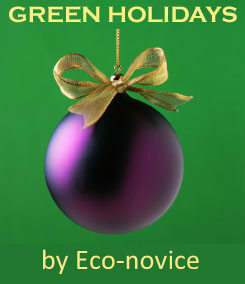 visit my Green Holidays page.